Atomic Salts' Cherry Bubble Gum nicotine salt juice has a savory punch of cherry twisted with the classic taste of bubblegum. A new sensational taste unlike any you have ever tried before. You can find anything you're looking for with the Atomic Salts brand juice, from the sweet and unique flavors of Vanilla Custard and Cherry Bubble Gum to the minty Evermint Menthol. 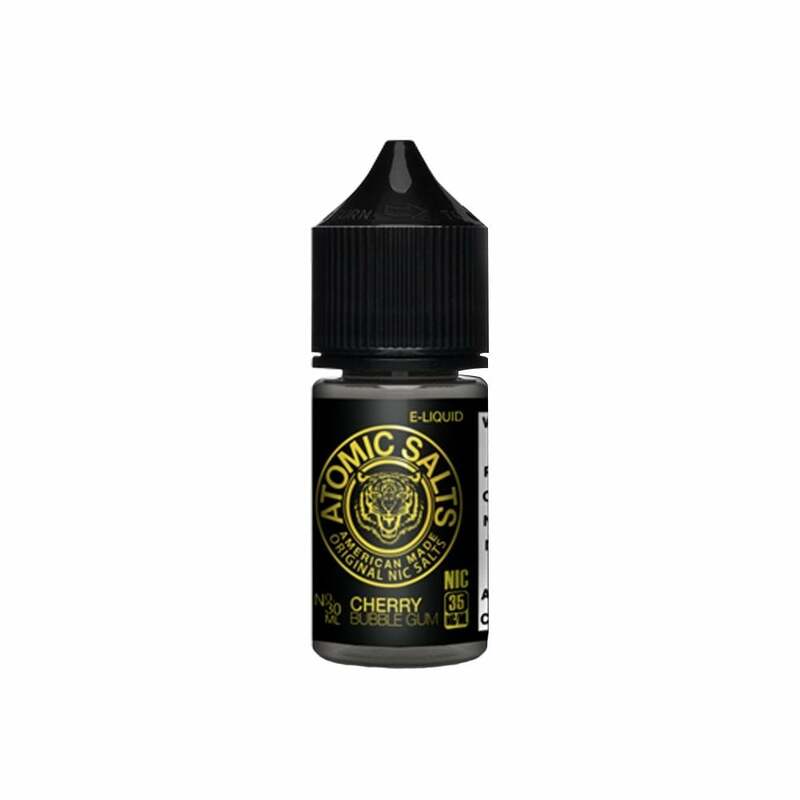 Atomic Salts salt juices are available in 50mg (5.0%) and 35mg (3.5%) nicotine strengths and have a 50/50 VG/PG ratio. I like it a lot. I was hoping for more bubblegum flavor but the mix is good. I'm gonna order 2 more bottles because of the price. I am picky, so good job on this one. Its very cherry flavored not so much bubblygum. I’ve been looking for a bubble gum juice that tastes like the gum I chewed as a kid. This is it!! You want cherry bubblegum? You got it! Very flavorful, and precisely what you'd expect given the name. Unfortunately, it's not a flavor I enjoy, though I thought I would. That's not to say it isn't what it says on the tin. It is. This juice is extremely harsh and makes my throat burn. It's too strong and unlike other juices. Well not to bad I defiantly like it bought 4 bottles of it and enjoyed all of them. flavor gets a little bland after a while but do recommended to those that like monster energy drinks kinda smells like it but good taste. Very little flavor. Tried it in several pods and always had a burnt after taste. I was hesitant to try a bubblegum flavor. I agree with the person that said this tastes like bazooka bubblegum. It is very light on the cherry flavor, but I don't mind that since I was more looking for a sweet bubblegum flavor. It's rather dry but this might just be my new favorite juice. I get tired of all the fruit juices tasting the same. I like this juice and am reordering another. Great taste. Extremely good flavor. One of my new favorites.